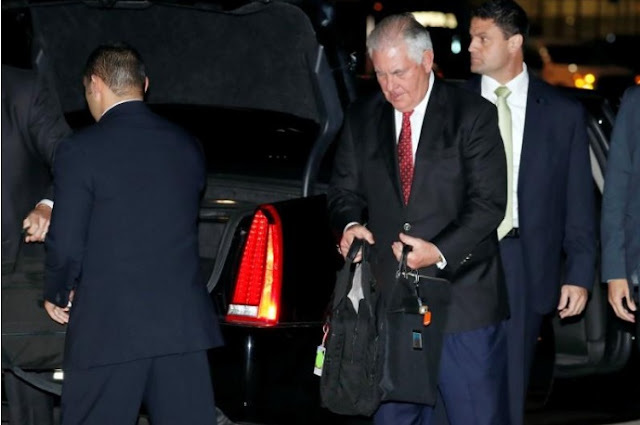 U.S. Secretary of State Rex Tillerson gathers his things to board his plane to depart for a several day Mideast trip, Friday, Oct. 20, 2017, in Andrews Air Force Base. RIYADH - U.S. Secretary of State Rex Tillerson arrived in Riyadh on Saturday at the start of a six-day trip which will also take him to Qatar, a fellow Gulf Arab state which is in a diplomatic dispute with Saudi Arabia. Tillerson flew into King Salman Air Base and will later meet with Saudi Foreign Minister Adel al-Jubeir. U.S. Secretary of State Rex Tillerson arrived in Riyadh on Saturday at the start of a six-day trip which will also take him to Qatar, a fellow Gulf Arab state which is in a diplomatic dispute with Saudi Arabia.